29th November 2018, SINGAPORE – The World Wide Fund for Nature (WWF) has congratulated the Agri-Food and Veterinary Authority of Singapore (AVA) for proposing a total ban on ivory in Singapore. WWF noted that Singapore’s proposed ban makes no exceptions in the closure of the domestic ivory trade, placing it ahead of similar bans around the world. WWF also highlighted additional rollout and enforcement measures which will ensure that Singapore’s ban will be the world’s most robust and stringent. AVA is currently undertaking a public consultation for the proposed ban which ends on 27 December 2018, creating an opportunity for civil society to contribute views and comments. “Singapore’s proposed ban carries global significance given our role as a transhipment hub - including for illegal wildlife trade. A stringent ban will impact and deter organised criminal syndicates behind the ivory trade and elephant poaching crisis. This move demonstrates Singapore’s strong leadership in addressing the ivory trade, and is a clear signal that Singapore does not tolerate illegal wildlife crime, trafficking and trade,” said Kim Stengert, Chief Strategic Communications and External Relations, WWF-Singapore. As part of AVA’s public consultation process, WWF has outlined recommendations for the rollout and enforcement of the ban. If implemented in full, these measures could position Singapore’s ivory ban as the world's most robust and stringent, making a real difference to elephant populations. 1. To put measures in place to handle the current ivory stock of existing retailers to prevent stockpiling. WWF recommends an immediate suspension of the issuance of import and export licenses for pre-convention ivory to ensure that the ban will not lead to stockpiling of new ivory or increased supply or demand in other countries. Additionally, we recommend that retailers are required to declare their inventory immediately. Undeclared items should not be allowed to be traded - even before the end of the grace period. To leave as few loopholes as possible, and in order to avoid the risk of Mammoth or Mastodon ivory being laundered as elephant ivory, we recommend to require a permit for trading of ivory from extinct species and traders to prove the authenticity by providing a certificate issued by a credible third party. 2. Increase penalties for ivory and other illegal wildlife traders, matching the gravity of the crime. In order to tackle the inevitable increased incentive for retailers to continue trading ivory on the black market, we need to ensure that penalties are commensurate with the gravity of the crime. We strongly recommend replicating success already seen in other countries by applying a 4 year (minimum) to 10 year (maximum) sentence. In addition, and in recognition of the fact that the primary risk for Singapore is its position as a possible transit hub for ivory trafficking, illegal wildlife trade must become an indictable, “serious crime” and be linked to money laundering and cyber crime investigations. The four year minimum jail sentence is aligned to the definition of a “serious crime” under the UN Convention against Transnational Organised Crime, thereby facilitating transnational collaboration in its enforcement. To further deter illegal activities, we recommend to allow the seizure of assets linked to wildlife crime. As Singapore is increasingly used as a transit hub for the illegal ivory trade, and larger volumes of ivory are being sent through Singapore, we also recommend that the maximum fine per shipment be raised from SGD 500,000 to SGD 5 million. 3. Deploy adequate government resources to ensure effective enforcement of the ban. Given the likely involvement of organised crime and the ongoing issues of both, tackling markets (physical and online) and Singapore as a potential transit hub for the illegal wildlife trade, we need to ensure sufficient deployment of relevant enforcement departments across police, border controls, cyber crime and customs units. In addition, in order to address the risk of trafficking into or through Singapore, there is an urgent need to scale up the use of intelligence-led investigations and risk profiling by customs and associated enforcement agencies. This will require meaningful inter-agency cooperation within Singapore, and collaboration of enforcement agencies in Singapore with those in source and demand countries of ivory. 4. Limit the grace period for ivory retailers to one year, instead of three. WWF strongly recommends that the grace period given to affected stakeholders be limited to one year, instead of three years as proposed. This is due to the “small and inactive domestic market” in Singapore, as identified by AVA. 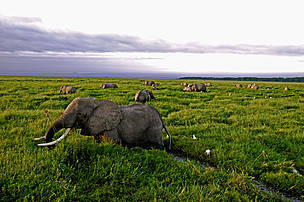 The global trade in elephant ivory claims one African elephant every 25 minutes. The global ivory trade re-emerged in late 2000s despite an international trade ban on ivory that has been in place since 1990. 20% of African elephant populations have been lost in the last 10 years. Ivory is a big part of illegal wildlife trade, the world’s fourth largest illegal trade, after drugs, human trafficking and counterfeited goods. The illegal wildlife trade is largely driven by transnational criminal organisations. To stop the global elephant poaching crisis, WWF-Singapore has been calling for a domestic ban in elephant ivory and stronger deterrent penalties and enforcement measures in Singapore, as well as close cooperation within the Association of Southeast Asian Nations (ASEAN) for united action against the illegal ivory and wildlife trade.